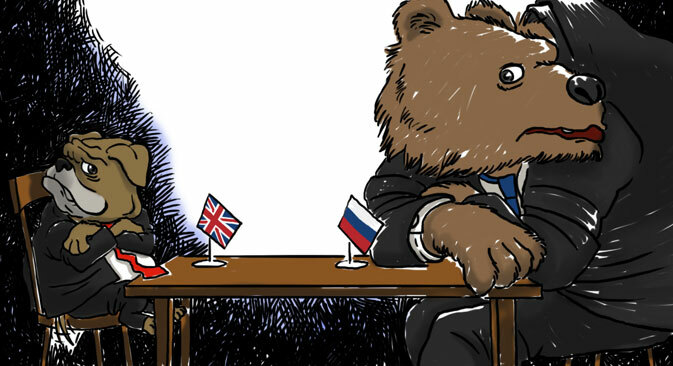 Russian-British relations are at their lowest point since the fall of the USSR. There is a growing feeling that nothing will change to improve them until after next year’s UK general election, as Bryan MacDonald explains. Ask a Londoner their impression of Russia. Oligarchs, beautiful women, nuclear weapons and mafia, are likely to crop up. Roman Abramovich and Chelsea too. Some may admit to admiration for President Putin, but more will insist he is a rum fellow. Repeat the trick in Moscow, but ask about England, (for it’s always England, never the UK.) Rain, tea, the Queen, premier league football, visa difficulties will figure. If asked to name the country's leader, most won’t know, but many will suggest the Queen and not current Prime Minister David Cameron. Russians and Brits don’t understand each other, they never have. Few visit each other's country. The Russians that do tend to be students, well-heeled, linguists or all three. Brits in Russia tend to be business people or adventurous young backpackers. A few soccer supporters, enclosed in the bubble around a match, may fly to support their team. But Brits and Russians have far more in common than they know. Both have similar notions of Europe and lofty ideas of their own place in the world. Both live in countries that once had empires that are on the periphery of Europe, where residents feel semi-detached from the continent. Just as many UK families have an ancestor who served in India or Africa, most Russians have a relative who worked in central Asia or further afield. Modern Russia is more a Eurasian empire than a European state, despite the fact that Russians mostly identify themselves as Europeans. However, when Russians visit Europe, they speak, like the British, of ‘going to Europe.’ They also show little interest in European political affairs, seeing it, mainly, as a place for holidays. By contrast, due to a common tongue, many Brits see America as being more interesting culturally than France or Germany. In the entertainment business, UK performers talk about making it in Hollywood or New York, not Berlin or Paris. Russians also have only a passing acquaintance with the vagaries of European life, with many more interested in events in China or Japan than Spain or France. Britain and Russia were uneasy allies during WWII. So long as Nazi Germany remained a common enemy and threat, it was easy to ignore the ideological disputes and antagonisms that divided the two great powers. Four years of cooperation against a powerful enemy was only a fleeting pause in centuries of mutual suspicion. Churchill built his political reputation on standing up to the communist threat in Europe. Margaret Thatcher also strongly opposed the USSR. "I hate communism," she told Mikhail Gorbachev before the pair had even sat down for their first meeting. Russia has never shaken off its distrust of the west. Western military intervention after the Bolshevik revolution has not been forgotten. There is also a belief that western politicians prefer fascists to Russians, something evident in current political rhetoric in Russia over the civil war in Ukraine. They also regard Europe in terms of a balance of power, another post-imperial hangover. Given German dominance in the EU, London has evidently decided that better Berlin, in tandem with US military power, controls Eastern Europe than Moscow. Russia doesn’t factor the UK in this equation but perceives Germany as the ‘boss’ of the EU. Following this year's revolution in Kiev and subsequent civil war, relations are at a new low. This comes after years of British resentment at Moscow’s actions, among them London's suspicion that the Kremlin was involved in the murder of Alexander Litvinenko, the former FSB officer who was poisoned in the UK capital. Russian officials see the UK as intractable. Despite huge efforts to build a friendship, their entreaties are constantly rebuffed. A high-ranking source in Moscow said: “Many of our team in London feel disappointed that, no matter what they do, they can’t positively influence the current British government. It's possible he means that if UKIP won enough seats to be part of the next British government there might be some hope for a normalisation of relations. Or that if Labour won and abandoned the pro-US policies Tony Blair championed. Given that Blair's name is now so toxic in the party, there’s some hope there. Doubtlessly, the UK establishment feels that Vladimir Putin’s administration is the problem and that if he disappeared so would the problem. If such views exist, both London and Moscow elites are kidding themselves. Russia and the UK have such a chequered history that it would require a massive effort by both to create a better framework. There would be no magic wand even if UKIP leader, Nigel Farage, who admits to admiring Putin, moved into Downing Street tomorrow. Ditto if Putin stepped aside and handed the reins to an enthusiastic liberal educated at Eton. The elite in both nations are too entrenched and the historical bitterness too profound.